Roku players come with remotes, but the remote isn't always within reach when you need it. Or perhaps it's gone missing someplace in the black hole that is your couch. 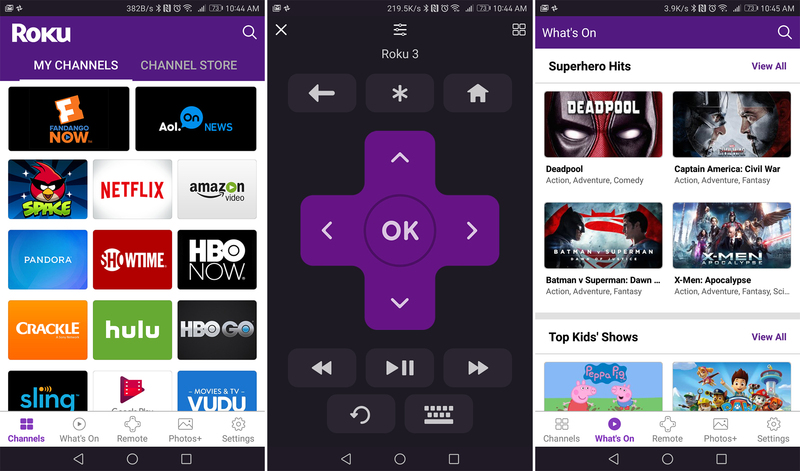 No matter, there's an app that can control your Roku, and it just got a big update. It's now quicker to navigate and makes it easier to find stuff to watch. Never wonder what to watch next. The new What’s On feature puts an entertainment guide in the palm of your hand. The Roku app has jumped on the bottom navigation bar bandwagon today, which makes it quicker to get around. It offers links to the channels, what's on, remote, photos, and settings. "What's on" is actually a new part of the app, and as the name implies, it helps you find something to watch by suggesting content across all available channels. Meanwhile, the Channels area of the app has been tweaked so each channel you've added now also acts as a button that launches it on the player. There also appears to be a slight change to the look of the remote. It's now more in-line with the aesthetic of the real Roku remote control. The updated app is live in the Play Store for all, but Roku has not yet updated its screenshots. You can see the new app above.